Antique Toleware Collectors are passionate about their collection, I am thrilled to share that passion with the readers of VICTORIA MAGAZINE this month. I was immensely honored to be asked to write about one of my favorite antiques for one of my all time favorite magazines, VICTORIA. I hope that you go out to find a copy, if you don’t subscribe to this beautiful publication. Always filled with beautiful and elegant inspiration, each issue is a keeper. Antique Toleware is hand painted, each one is a piece of history, and a work of art. 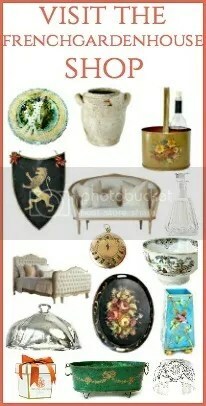 It’s one of the most asked about antique we sell at FrenchGardenHouse, I’m sharing some of its history today. Toleware refers to items and other decorative objects made of tinned metal that have been lacquered and adorned with a design dating from 1600 – 1900. From the French Tole Peinte du Lac (French for “painted sheet metal”), tole painting refers to applying paint and lacquer to tin, it began as a way to prevent common household objects from rusting. Welshman John Hanbury, who had a metalware business in Pontypool in the 1600?s, is credited with inventing the method of “japanning”. He made tin trays and other utilitarian objects that were very much sought after. Hanbury developed a process that would alleviate rust on the metal, coating the painted surface with a mixture of asphalt and shellac, and named the process “japanning” because the glossy surface resembled the lacquer on Japanese trays. Hanbury’s Pontypool trays and other pieces were painted pewter and quite expensive. Distinguished by lacy openwork rims, Pontypool trays are still some of the most sought after tole trays today. Toleware was designed during the 17th and 18th century to imitate the exotic lacquered items from Japan, Toleware from that period was most often decorated in the chinoiserie style, depicting Asian scenes on a black ground. The French had their own version of Tole Peinte, using a superior varnish such as vernis martin, they designed and created true works of art, using bright colored backgrounds with a variety of decorations. Elegant and more sophisticated, they elevated the tole pieces into works of art. Stately urns, jardiniers (plant pots) boxes, and trays were produced and carefully hand painted by artists. By the early to mid 1700’s, painted tin was being manufactured in England, and shipped to the colonies. As with many imported items, American tradesmen and artists soon began to produce toleware. Irish brothers Edward and William Patterson, who had settled in Berlin, Connecticut in 1740, produced hand shaped cooking utensils which they sold door to door. A 1749 English law forbade the production of tin in America, so initially they imported tin from England, even with importing costs, their business flourished. After the American Revolution, they made beautifully hand painted trays for the gentry, and shiny, unpainted and uncoated trays called “poor man’s silver” for those with less deep pockets. By the late 18th century, most tinware was decorated before being sold. Family workshops in Connecticut, Maine, New York and Pennsylvania produced toleware for sale. The men worked the tin and sold it after it was finished. The painting of tinware was known as “flowering”, and the women “flowered” or decorated the finished pieces, with beautiful hand painted designs. In the 1950’s and 1960’s, American companies like Plymouth, Nashco, Pilgrim and Fine Arts Studio produced trays that were hand painted in assembly line manner, using the distinctive one stroke method. A brush was loaded with one or more colors and applied to the metal in a single stroke, creating shading and depth to a flower, leaf or other decoration. These “studio trays” were beautiful, and painted by accomplished artists, mostly men. Some of the more famous artists from this time period are Paul Dennis, Van, Fred Austin and Francis. If you are really fortunate, you will find a tray or other piece of tole with a signature. These pieces were, and still are, very popular. Tray prices can range from 35.00 to thousands, depending on age, condition, subject matter and how well painted the tray is. Collectors look for unusual colors, what they collect differs as much as toleware pieces differ from each other. Some collect only chinoiserie, pieces with mother of pearl inlay, roses, only black trays, or only French, or English, or American objects, for instance. Collectors look for pieces that don’t have damage on the painted scenes or decorations, these will always be more collectible and worth more than objects where part of the hand painted embellishment is peeling or damaged. Next time, I’ll share some hints on how to display your toleware collection! You can see our toleware pieces here. Do you share my passion for antique toleware? Be sure to sign up to follow my blog in the right hand corner so you don’t miss a single post! This is awesome…I can’t wait to read more!! Congrats, Lidy! I love toleware. Can’t wait to read your article in Victoria! Congratulations! Oh what a beautiful blog you have….and so much for me to explore and learn! Can’t wait. And you’re right….Xiu Xiu is an extremely spoilt and pampered pooch! How did you guess!!! Thank you Robyn! Bentley says “hi” to Xiu Xiu…. I love toleware, especially when the are grouped together on a wall. So beautiful. Thanks for taking the time to leave a comment, Tammy! So excited to see you article and collection of toleware. I have been collecting the trays for over 30 years and have my favorites displayed on the walls in my kitchen. Can’t wait to buy the magazine and am thrilled to find your blog!! Congrats on your Victoria magazine article, I really enjoyed it and your writing is so informative. I’ve always enjoyed toleware and thanks to your article I now know the history of this unique art. I look forward to reading your blog posts. Hi Jo! Thank you. I hope things are going well with your new shop! Congratulations on your Victoria Magazine article! I love Toleware and learned a lot from your article. You have so many fantastic treasures in your shop. Great Feature!! Thank you so much Jody! I so appreciate you leaving a comment. Hope you have a happy weekend. Hello Lidy, a pleasure to meet you. Jane pointed me to you. Your blog is lovely. Congrats on the feature! The trays are absolutely gorgeous. You have quite the collection. Happy Thursday. Hi Linda, I’m so happy to meet you too! Thank you for leaving a comment, I will go and find your blog and enjoy your posts.